Feeling dizzy while running is the worst, and it can happen to anyone. I’ve experienced it in in my own runs, and I’ve seen many of my friends and running partners deal it as well. If you feel lightheaded during a workout, you may want to determine the reason why that happens, then do something about it ASAP. That’s where today’s article comes in handy. Let’s discuss why you feel dizzy during or after running. Let me start by saying that you probably don’t have a brain tumor if you get lightheaded while running. Just because you get dizzy doesn’t inherently mean that you’re suffering from a serious health ailment. But dizziness while exercising is not something you can write off either—especially if it’s persistent, draining, or that it feels like you can’t stay on your feet. Dizziness while running can vary from a moderate annoyance to a severe instability that may interfere with your training quality or post-training enjoyment. The condition can be accompanied by a host of symptoms, such as a feeling of poor balance or false motion, blurry vision, nausea, heavy or floating head, weakness, or fainting. These symptoms can manifest suddenly while running or after running or build slowly over time. If your head starts spinning or you get woozy during a run, various culprits could be to blame. 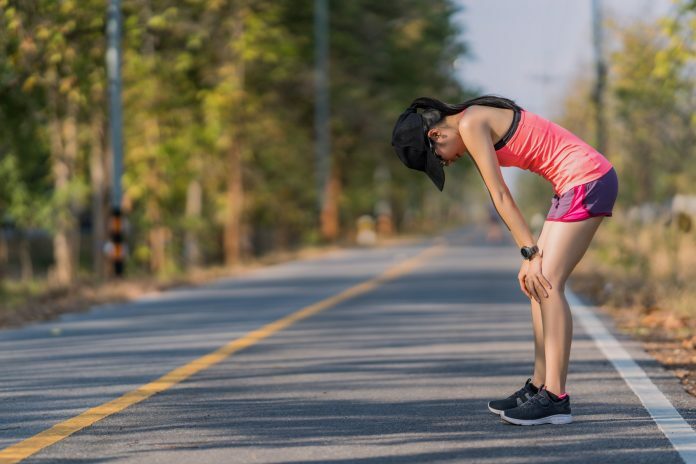 If you experience sudden dizziness or lightheadedness right after finishing a particularly intense run, low blood pressure could be the reason. When running, your cardiovascular and muscular system are actively contracting, transferring blood from the lower extremities back to your heart and the rest of your body, especially your brain. But here’s the little caveat. When you stop running on the spot, you lose that muscle pump, and your heart and muscles quickly return to their usual pace, which decreases blood circulation, resulting in lightheadedness and weakness. Although it’s not always possible to prevent blood pressure drop, cooling down properly following a workout seems to help, especially if you tend to get lightheaded the moment you stop running. Do a 5- to 10-minute cool-down before jumping in the shower. Give your body enough time to gradually and slowly transition back to a normal and resting state. Here’s your full guide to proper cool-downs. Nausea and dizziness are both symptoms of dehydration. That’s why staying well hydrated during the day is crucial. In addition to losing fluids, you also sweat out electrolytes, especially sodium, that helps maintain water balance and proper functioning. And guess what? Electrolytes imbalances can also cause dizziness. The best way to ward off dehydration is to drink plenty of water throughout the day. That way you make sure to stay well hydrated before, during, and after your runs. Shoot for at least two to three glasses of water during the two hours before you head out. Also, remember to bring water with you on long-running sessions—especially when training in the heat. Aim to sip an ounce or two every 15 to 20 minutes. Here’s your full guide to hydration. Your diet also matters. Running on an empty stomach can lead to low blood sugar, or what’s referred to as hypoglycemia. Food is energy, and if you’re skipping meals, you won’t have the fuel you need to keep up with the demands of your training. When this happens, you’ll often feel lightheaded, weak, or experience dizziness or trembling. Unless you have diabetes, preventing this condition is easy: Have the right food at the right times. Instead of exercising on an empty stomach, go for a light meal or snack—preferably one containing complex carbohydrates and protein, such as yogurt with fruit as well as apples with peanut butter. If you don’t have time for a full meal, having a smaller snack such as fruit or crackers before running can help. These types of good will keep you going strong for longer without upsetting your stomach. If you tend to hold your breath or use a rapid shallow breath while running, then you might be setting yourself up for head-spins while working out. If you can no longer control your breath while running, decrease your training intensity or stop to rest and recover. Don’t push it. To err on the side of caution, especially if dizziness is a big issue, stick to a conversational training pace. This means being able to talk while running without panting for air. You can also synchronize breath with your steps during running. Here’s the full guide. For example, you can opt for a 3: 2 breathing patters – in for three, out for two…. Inhale, inhale, inhale, then exhale, exhale—all in sync with your step. The increased demands placed on the body combined heavy sweating (dehydration) can lead to lower blood volume, which results in lower blood pressure. This can leave you feeling dizzy, lightheaded, or even faint. Running too much too fast can do more than harm than good, so listen to your body and adjust your training accordingly. If you’re feeling lightheaded or dizzy during a high-intensity workout, slow down and take a minute to catch your breath and slow your heart rate. It’s great to push yourself on the running track every now and then, but don’t turn it into a habit. Otherwise, you might be setting yourself up for a painful setback. The above list consists of the most common factors that could be causing (or at least contributing) to your condition, but they don’t cover the full gamut. In some cases, your dizziness while exercising can be blamed on underlying medical issues, such as ear problems and heart diseases (one of which is an abnormal rhythm, known an arrhythmia), or taking certain medication, especially blood pressure medication. In case you adjust your training approach but continue to dizziness while exercising, make an appointment with your doctor ASAP. If you start to get lightheaded while running, slow it down or stop immediately. Before picking up running again, try to rule out the cause of the lightheadedness and a practical solution. Are you running on the treadmill? Hit the emergency red stop button and stop down. If the condition persists, find a place to lie down and rest. Lie down and elevate your legs above your heart, placing your feet up on a wall, chair, or bench. The above guidelines are the best tools you need to deal with feeling lightheaded or dizzy while running. The rest is just detail. In the meantime thank you for dropping by. 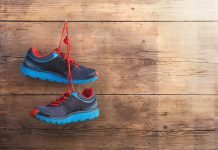 Next articleAre You Making These 5 Running Shoe Buying Mistakes?